Merrill and I spent most of April in China. What was different this time though was that we did an organized tour! We certainly aren’t what you’d call adventure travellers, but we are experienced enough to get around on our own most of the time when we travel. But for China this tour suited as we had limited time and wanted to cover a lot of ground, and people had told us that China is more difficult. As it turned out we probably could have got our own way around, but not in the time frame we had available. We did an Intrepid tour this time, named “Explore China” (which was officially renamed “Wild China” sometime while we were doing it). The price was quite reasonable and they seemed to get quite good deals on the hotels we stayed at, as the listed prices were much higher than what we seemed to be paying through Intrepid. The best thing was all the transport arrangements, hotels and entrance fees were included, so it was nice to be lazy for once! Also were lucky to find cheap flights, much cheaper than Intrepid were offering. We flew Qantas from Sydney – Shanghai then Beijing – Hong Kong – Sydney for $1100 each. Haven’t been able to find any that good since! Nice daytime flight over New Guinea and the Philippines, including great views of Mindanao and Cebu, before coming in over the ports and mudflats of the Shanghai coastline. Landed at the amazingly new and big Pudong airport, and then onto the Maglev train, which hit 300km/h and only took a matter of minutes to Longyang Rd station where we swapped to Metro line 2 for East Nanjing Rd. It was then a short walk around the corner to our hotel, the Nanjing. We had a reasonably sized room with a slab of concrete for a bed and a little balcony overlooking Tianjin Road. Went for a walk and had nice but not very Chinese dinner at Jamaica Blue, off Nanjing Road, mainly because it was one of the only places open. Discovered our room was very noisy, with someone repairing their motor scooter from about 1am onwards. Tried the hotel buffet breakfast, which was good value at 30 yuan and had many vegetarian options, but unfortunately most dishes were freezing cold! Caught the Metro to Hongqiao station, which is as big as an airport (in fact bigger than many airports we’ve been to) and very modern and crowded. After a bit of asking around secured our tickets on the bullet train to Suzhou, but unfortunately had to wait over an hour for the next available train. Surprisingly there was little in the way of shops or food there, very unusual for Asian railway stations. When it was time to board, “flight attendants” in red outfits appeared to check tickets at the boarding gate and you then went downstairs to the bullet train. The trains were very nice, with big seats and very quick. We were at Suzhou in about 30 minutes, even though it never felt like Shanghai had actually ended. We then found our way to the local bus station and got our tickets for Tongli, which was another wait. The bus trip to Tongli took about 45 minutes, skirting around a large lake before depositing us at a tourist centre where we boarded a golf cart to Tongli itself. 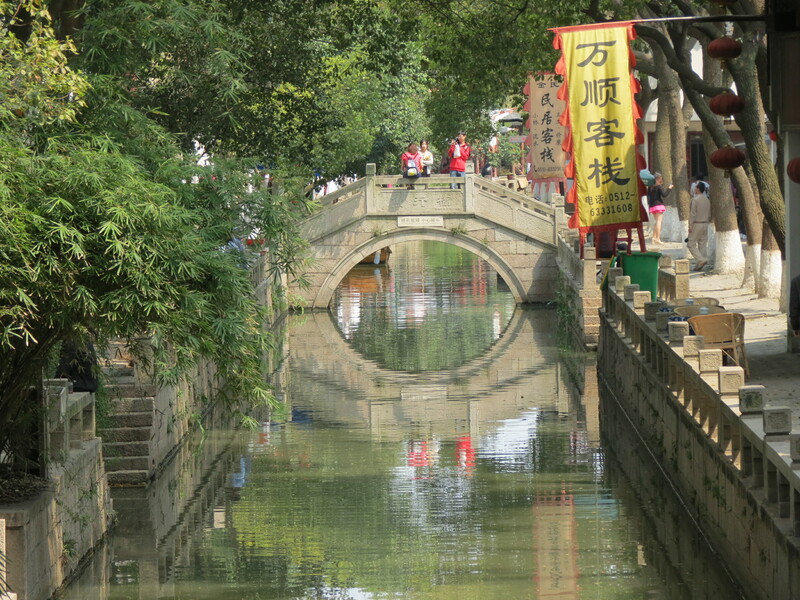 The ‘water town” was delightful – narrow streets, not too crowded, picturesque canals and bridges. Spent an enjoyable couple of hours including visiting two historical homes with excellent gardens, the Jiayin house and Tuisi gardens. Both had beautiful ponds and very old trees. But really, it was nice just wandering around the pretty streets without any cars, and the sun was out too! Caught the bus back after yet another wait, and then onto the bullet train back to Shanghai again, coming in at Shanghai station this time. Had a delicious vegetarian dinner at the Vegetarian Lifestyle restaurant at 258 Fengxian Rd, Shanghai, China then caught the metro back to the hotel. Woken up early by very bizarre loud laughing that went on all morning, a laughing club perhaps? Started the day with a great breakfast from a stall selling delicious, crispy shallot pancakes fried on a hotplate with egg and lots of oil. The stall was just up from the corner on Ningbo Rd. Caught the metro down to Yuyuan station and firstly wandered through the markets there, before heading into the traditionally styled shopping centre. Visited the very impressive Yuyuan gardens, a series of courtyards and enclosed gardens spread over a large area, with beautiful ponds, pavilions and rock gardens. Highly recommended. After a very pleasant hour in the gardens we visited the much noisier City Gods temple, that honours an ancient official that was elevated to god status. Highlights included watching locals offering prayers and lighing massive bunches of incense, and the very bizarre and colourful statues of minor deities behind the main altar. Next it was off to lunch at Chunfeng Songyue Vegetarian Restaurant in the Yuyuan bazaar complex. Confusing self-serve/ordering process but delicious filling food. Shame the staff all looked so bored and miserable. From there we attempted to follow the guided walk from one of the guidebooks through the old parts of Shanghai, but unfortunately things have changed a bit and the walk didn’t really link up that well, and one street had been completely demolished. Did see the remnants of the old city walls. We then caught the Metro back to our hotel in preparation for our Intrepid tour group meeting. The people on the trip all seemed nice, and the leader seemed very organized and pleasant. We headed off to a group dinner at a nearby restaurant in Shaanxi Nanlu, but I don’t know its name as all signage was in Chinese. Had a very nice selection of vegetarian dishes thanks to our guide, and a tasty bottle of Snow beer, all for about $7. Then went for a walk to the Bund to see all the lights of the Bund and Pudong at night, which was very crowded and very colourful (and absolutely freezing!). 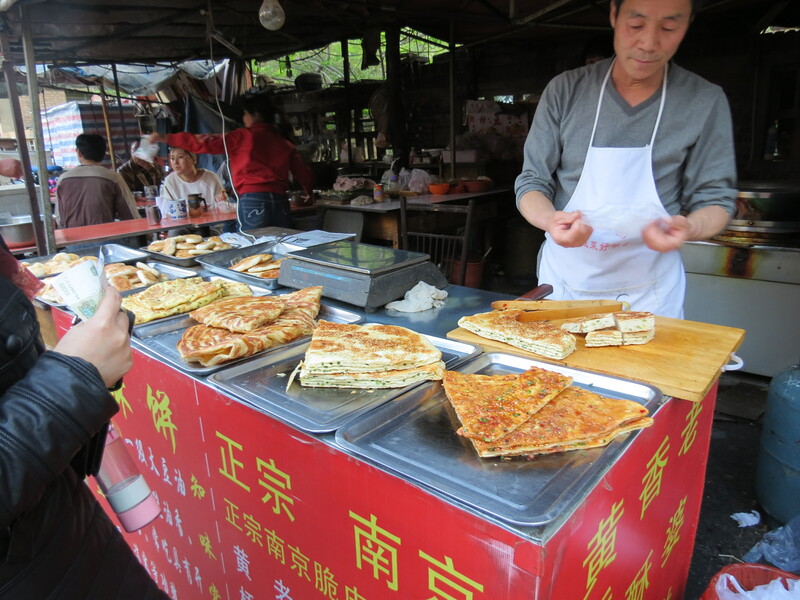 The next morning was the official beginning of the trip, which began with more yummy spring onion pancakes and vegetable dumplings for breakfast. It was then a guided walk along the Bund which looks much better at night. Finished up back at Yuyuan where we left the group and did a bit of souvenir buying and general shopping before wandering back along the Bund for a closer look at the historic buildings using our guide book. Highlight was the sumptuous Shanghai Club, which once had the longest bar in the world, but is now the Waldorf Astoria hotel. The bar was great and totally empty, and the ballroom was very fancy. That evening we went to a spectacular acrobatic show. The cast were mostly teenagers and they did some clever stuff, and the show finished with 4 motorcyclists in a cage of death. Sadly though the cast all had to hang around out the front trying to sell DVDs of the show in their threadbare costumes. Night ended on a downer as we got to the vegetarian restaurant we wanted to try just as they closed, so it was Jamaica blue again for dinner as nothing much else was open. Our last morning in Shanghai was spent at the Shanghai Museum which was excellent, just wish we had more time. Unfortunately though our train left in the early afternoon, so we didn’t get the full day we thought we were getting. My favourite part of the museum was the paintings, which are big and so much more impressive than in books. Caught the metro to Shanghai Station for the train, had time to stock up on food and even a bottle of erguotou, a powerful form of rice spirit. Certainly an essential for keeping out the cold. Our sleeper was very comfortable, and we were very glad we upgraded to the soft sleeper. Had a reasonable sleep and woke up ready to be a novice at the Shaolin Monastery. After breakfast at Luoyang station we hopped into a bus and drove up through some nice mountain scenery to Shaolin, where we stayed in a village near the monastery. The hotel was converted from former students accommodation and had a novel glass walled bathroom and its own communal loungeroom. Wandered down the hill to the monastery complex, spotting some interesting birds and even a squirrel on the way, and first went to see the kungfu performance, which was mildly entertaining and occasionally skilful. Highlight was watching people from the audience attempting some of the moves. Most of the cast was again children. After the show wandered through the monastery, most of which has been rebuilt since the cultural revolution and seemed to lack a bit in atmosphere, trading more on its fame rather than any architectural or cultural merit. Some interesting statues and a traditional pharmacy which I would like to have known more about. Then wandered up to the “Pagoda forest”, the pagoda graves of prominent monks, which were in a nice garden setting, before a yummy and filling group lunch at the monastery’s vegetarian restaurant. After lunch watched the school students going through their kungfu training exercises on the enormous parade ground, before wandering back to hang out at our room. Annoyed though to find out that some of the group went up the cable car and it sounded great – wish we’d known. Had a very odd vegetarian group dinner in the village which consisted of many dishes made up from ingredients you’d find on the forest floor. Possibly the strangest veg food ever. Finished the evening with drinks in the lounge. Next morning it was steaming dumplings in a freezing and damp corner shop/restaurant in the village, before driving back to Luoyang and straight on to the Longmen grottos. After a bit of a delay due to the Chinese prime minister visiting the caves, we got in to see these wonders. The caves are set into a cliff along the river bank, with rather sad little buddhas all peeping out at the view (except for one dopy smiling one). 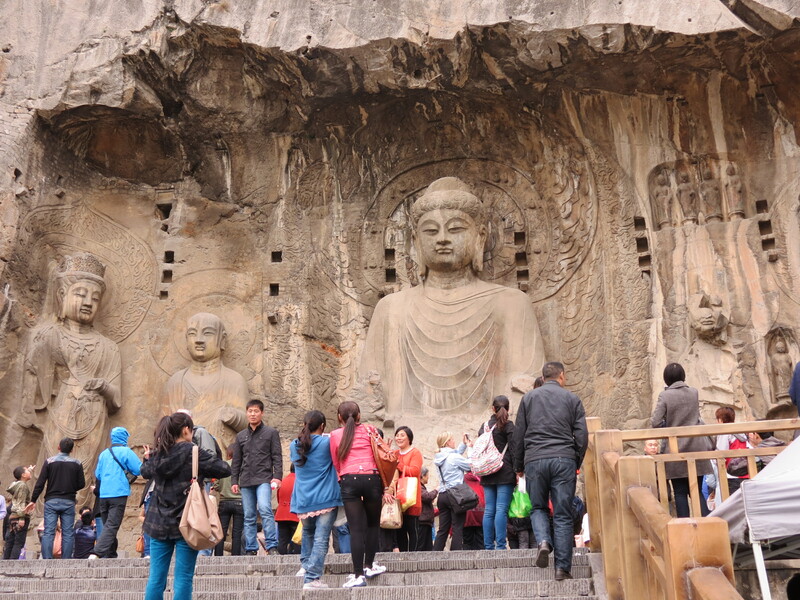 The caves culminate though in several large spectacularly decorated and carved caves, featuring larger buddhas, with the grandest one being a massive 10m buddha flanked by guardians, Ananda and other boddhisattvas looking out from the cliff across the river. This buddha is reputedly based on the queen who built the caves. Looked at a few minor caves and didn’t really have time to cross the river to view the cliffs from the other side, though as it turned out, no one else in the group worried too much about getting back to the meeting point on time. The bus took us back to our hotel, and from there we caught a taxi out to the famous White Horse Temple, the first Buddhist temple in all of China. The temple complex was set in beautiful grounds, and all the halls had interesting statues and hangings. This is the home temple of Tripitaka, of Monkey fame, although he is more usually connected with Xi’an where he placed the scriptures on his return from India. Highlight was the Qiyun Pagoda, built in 1175 and believed to be the first pagoda in China. People were circling this pagoda and clapping, but not sure why. Sadly only one of our group joined us on this visit, which is a pity because it was the nicest temple of the trip. Caught the last taxi back to the park near our hotel to look at the peonies, which are China’s national flower and big in Luoyang, before returning to our hotel which was one of the Greentree chain (can’t find ours on Tripadvisor), but I think it was on Xiyuan rd. Next morning it was bakery breakfast before catching the daytime bullet train but not before a quick visit to the park for more peony photos. A very comfortable and fast bullet train brought us next to Xian. Checked into our hotel, the Guangzhong, before doing a group walk to the Muslim quarter of Xian. Went past the Drum and Bell Towers and then into the very touristy quarter, which consisted mostly of emporiums selling local dried fruits, nuts, beans and other snacks, and kebab and bakery stalls. Flat breads more reminiscent of the middle east were everywhere. We went up as busy laneway and found a place for lunch, most people had dumplings and I tried a bowl of jelly like riceflour cubes in a great spicy sauce. Other specialities were also available, like quail eggs, cold noodles and fried persimmon cakes. All totally different to what we usually think of when we think of Chinese cuisine. Walked through some narrow lanes full of clothing stalls to the old mosque which was closed at the time, then through the Chinese market area which was touristy but fun, with lovely wooden terraces and shops selling calligraphy tools. Merrill and I separated from the group here and as time was short, needed to rush down to the Big Wild Goose Pagoda before closing. We found the new subway near the city walls and hopped off at Xiaozhai station and from there it was a 20 minute walk to the pagoda. The grounds were very pretty with some nice temple structures. This temple also figures in the Monkey story as it is here that Tripitaka left the scrolls he brought back from India, and there was a display showing his route. Didn’t actually go into the rather drab tower itself as it looked pretty empty inside and you had to pay more on top of the already expensive entry fee to go in. Instead headed out but first got conned into the souvenir store on the pretext of them giving us a special “visitor’s card”. Set off to find dinner, ended up at an odd Chinese/western restaurant near the fountain and had a terrific vegetarian hotpot which as well as tasting great kept me amused for ages putting all the different ingredients in. Merrill settled for an equally yummy baked pasta dish. Sadly couldn’t find any of the vegetarian restaurants that are supposed to be near the temple. Then it was off to the fountain to grab a good spot for the water show, which was pretty and colourful but went just a bit too long. Caught the metro back to the Bell Tower station then back to the hotel. 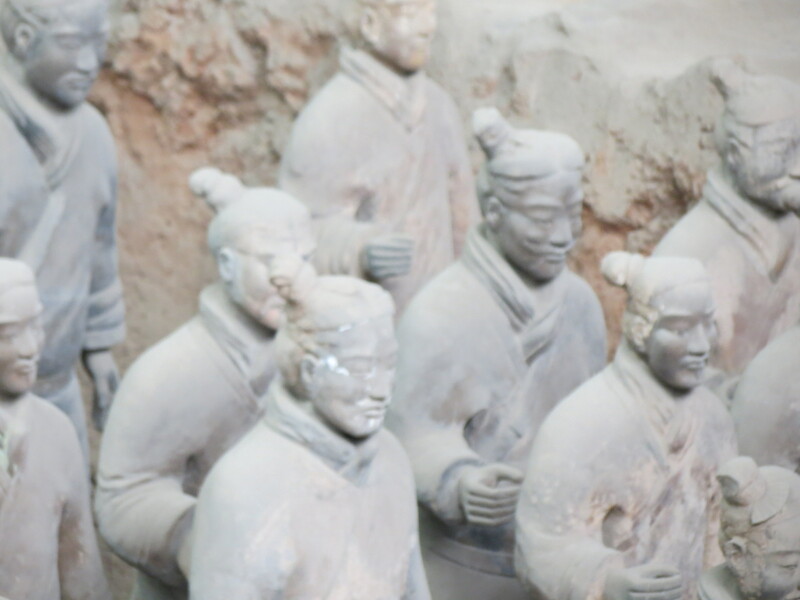 Next morning it was a bakery breakfast before heading out to the terracotta warriors. After lots of stuffing around in the souvenir shop (where we saw the farmer who found the first warrior) and watching a mediocre film proclaiming the achievements of emperor Qin in uniting China, we finally entered the first of the huge halls of warriors, some complete but most as they were found in bits. From the distance you stand the rows look impressive, but with the aid of binoculars you can see the amazing detail and variety of the statues. The next halls featured the warriors in an underlit pit, supposedly the “command centre”, and the other hall showed more of how they were originally discovered, as well as giving you a chance to get up close to some of the statues. There was another hall which for some reason the guide dissuaded us from visiting. Bought the obligatory fake mini warriors from a guy for much less than the souvenir shop, only to have someone approach asking even less, so if you want to buy these when you are there, just wait long enough! Our group then went for a “home cooked” farmers lunch at a restaurant supposedly run by farmers dispossessed by the complex, but given the nice little villa they had they had done well out of their farm being acquired. What was odd was the reaction of the group to what was really basic, bland food, which was reconfirmed later when we got a tour of the kitchen to find that the ingredients were basically rice wine and MSG. Everyone just raved about it, whereas Merrill and I were wondering what the fuss was, as it was pretty ordinary food. OK, the old folk making it were cute, but it was amazing the effect of the magic words “farmer” and “home cooked” had on people. Interestingly too, it turned out to be the most expensive group meal of the trip in the least fancy restaurant, with the most basic cheap ingredients, with celery being the most exotic of the vegetarian dishes. Anyway, enough complaining. Got back to Xi’an and made a rush visit to see the little White Goose Pagoda, but it was already closed, so walked back which led us to a great discovery of a local street market. All sorts of interesting food stalls, with delicious flat breads, noodles, self serve street buffets on the back of a scooter, and all sorts of necessities like clothing, toys and fruit. All the stalls were very busy with locals, and tried some yummy breads. From the city walls we caught a tuktuk back, the Xi’an version being only just big enough for the two of us in a glassed in box, and driven by a happy driver who chatted to everyone along the way, no doubt telling them all of the huge weight he was hauling. Next morning it was a group bike ride along the top of the city walls. The walls are maybe 30 metres wide so plenty of room to whizz along on our bikes. I rode two sides of the walls and went ahead of the group because they were taking so long with photos, then headed back to find Merrill who was walking along. We swapped over and she rode back, which left me to walk about 2km by which time the group had buggered off and left us behind. Would have been nice of them to wait or at least leave a message with the bike rental people. So we rushed back, luckily having the skills to know which bus we needed to catch and got back to the hotel before they had left for the station. It was fun on the walls looking down at markets and people performing music or tai chi in the parks below. Headed off to the station to get our overnight train to Chengdu. Had a nice 4 berth sleeper carriage and were treated to some beautiful mountain scenery as we headed over the hills into Sichuan province. Also had a fun party with Seb and Ron with much hilarity, lots of bai jiu and awful singing. Checked in very early at the Traffic Hotel in Chengdu and had breakfast in the hostel restaurant. Our room was really nice but the hostel looked quite cute too. Didn’t feel like eating after all that rice wine and after breakfast it was off to the Panda research park. Really nice gardens and the pandas seemed to have lots of room to move, and lots of vegetation to hang out in. Much nicer place to see them than when we saw them at Ocean Park in Hong Kong. Most fun were the 6 month old cubs who were being filmed but what they really wanted was to escape their keepers and head for the trees. 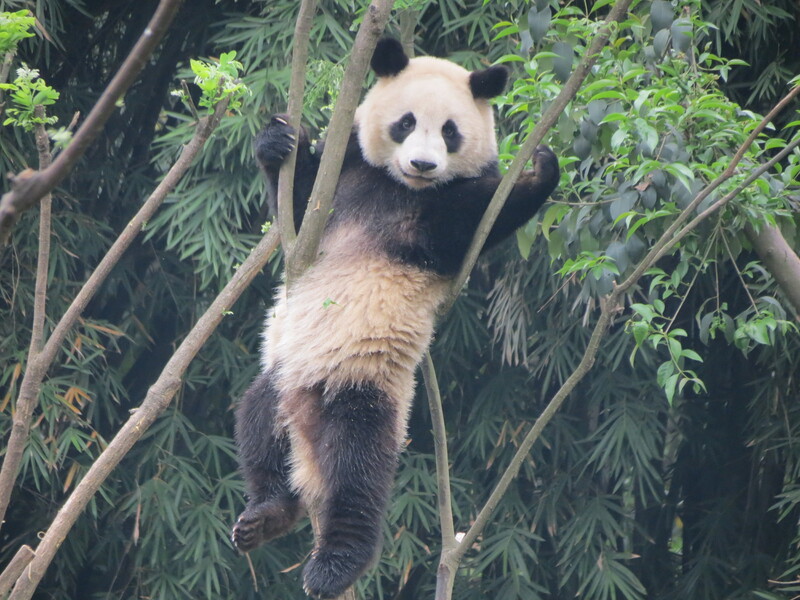 Very busy with tourists but pandas seemed oblivious to it all. They even made the grumpy American on our tour melt a bit too. Back in town we had a yummy lunch at the Cacaji Indian restaurant (I presume this is a Chinese spelling of Chachaji), nice food and lots of cute waitresses all saying “namaste”. Walked up to the main square to see the giant Mao statue in an uninspiring park, then past the old mosque to Peoples Park, which was possibly the noisiest, busiest, most well used park in the world, full of people doing karaoke, taichi, calligraphy, dancing, singing patriotic songs, badminton and even an open air dating agency. 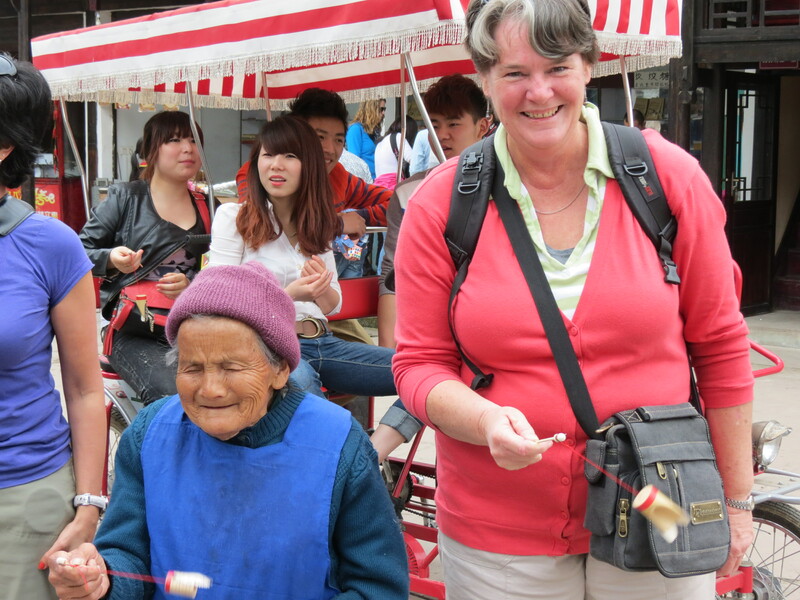 After merrill got stuffed around changing money we all got the bus to the Jingli district, a sort of fake ancient village, then wandered around the Tibetan quarter with its Buddha shops, Lama clothing stores and the very peculiar orange electric blender shop. Very heavy atmosphere in this area with army vehicles on every corner and some nervous looking Tibetans. Rest of the group went out for hotpot while we settled for nice noodles and a spicy eggplant dish at the hostel. Into the bus with the wonderful Mr Fu at the wheel, and a 2.5 hour drive up into the hills of Sichuan. Stopped at a tea “farm”, you can’t really call it a plantation, and was possibly the first flat ground level tea farm I’ve seen, and as about romantic as a potato paddock. Pingle on the other hand was very cute, with its laneways, rivers and bridges. Our guesthouse was an old courtyard with all our rooms off it. Only downside was our bathroom stunk like an open sewer. Had superb lunch in a wood panelled restaurant reminiscent of the inn in Crouching Tiger, possibly the nicest meal of the trip, lots of rich, spicy tofu and succulent mushroom and eggplant dishes. No idea what the restaurant was called however. Wandered around the interesting town, watched the unusual old people including an amazing little old lady that sold toy cicadas. Back at our guesthouse we learnt mahjong from Emma and Mr Fu, which isn’t all that different to the Polish Rummy I grew up with. Mr Fu was an excellent teacher and had everyone fluent in Mandarin numbers and suits by the end of the night, which was accompanied by rice wine and fried broad beans. Dinner was some very ordinary noodles in oil. Next morning was glad to escape our sewerage perfumed room and we walked with our packs to a noodle place. Had interesting corn buns, bolied eggs and sensational ginger pickles, and Mez bought some hot spicy potatos from a street vendor. Couldn’t resist the Yangyang ride outside the toy shop opposite so had to sit on it, freaking out the owner who thought it would break. Then it was into the bus after a look at a crappy market. A scenic drive up through the mountains brought us to the cute riverside town of Shangli. Checked in at Han’s guesthouse, a 300 year old mansion still run by the same family and also a local tourist attraction – don’t think we’ve ever stayed in a tourist attraction before! Small rooms around a large courtyard full of the family’s washing. Weird, tiny bathrooms.Went for a nice walk around town, with its river, old houses, shops, and mahjong cafes. Decided we were due for a lazy afternoon so grabbed our books and found a riverside bar and sat on lovely cane chairs and chatted to Ron and Seb, ate great deepfried snacks and had some nice local and even a German beer. One of the snacks was a Chinese version of potato latkes. Others played majong and ended up with a large and critical audience. Dinner at the “Red Army” themed restaurant which was very nice. Quiet night in room. Nice breakfast of handmade noodles and eggs before a 3 hour drive back down to Chengdu airport. Had 2 hours to fill in at the very new airport and our futile search for anything decently vegetarian ended with fries at KFC and some cakes. Slow through security but flight was pretty much on time. Arrived at the very fancy new airport and had a long walk to the luggage collection. Into a taxi and a 45 minute drive through skyscrapers and dusty roads brought us to our hotel, the King Parkview. Nice big room with usual hard bed, though slightly softer than others. Old style hotel, a bit worn out, but spacious, not much in the way of facilities but free wireless in lobby. Went off with Seb and Ron to find a vegetarian restaurant tht had good reviews. Our taxi driver had a bit of trouble finding it but he was very persistent andtracked it down up a laneway. It was worth the hunt as it was all delicious, with some unusual dishes and a nicely decorated place too (its the Baihe restaurant, Caoyuan Hutong). Next morning it was delicious street food outside the hotel. Had these great egg rolls in a type of flat bread similar to Turkish pide. Then it was a bus to Tiananmen Square, which was packed with people and soldiers. Then into the Forbidden City which was huge, crowded and looked just like all those kungfu epics. We managed to lose our group after they moved on without us, but rejoined them. With the group we walked up through the centre of the complex, then after seeing the pretty palace gardens we backtracked because we knew there was so much more to see, and there was, including a great exhibit about the last emperor, and the sumptuous quarters of the royal wives and concubines. Weahter by this stage got really crap, freezing cold and raining. Walked back to the hotel to get warmer clothes, then a light lunch at the funky Alley Cafe . Weather was better suited for shopping, and we had the luxury of a few more days because we are the Travel Possums and plan our trips well, so it didn’t matter about seeing all the sights in one day. Went to Wangfujing Dajie, a street of shopping malls (and a historic church in amongst them), all full of big designer labels. At Oriental Plaza found an enormous food court and a very well stocked supermarket, and had a nice Thai dinner at the Lotus thai in “food republic”, perhaps the only republic in China. Very crowded Metro ride back, then had to walk back to hotel in pouring rain. Another early start and more yummy street food and onto a tour bus to the Great Wall at Jinshanling. 3 hour drive then surprisingly easy walk up to the wall. 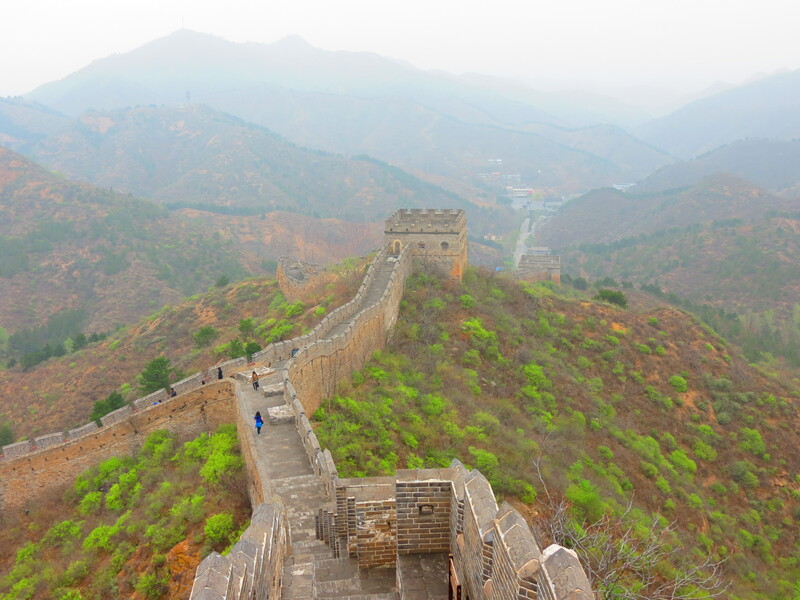 Lots of amazing views, can’t believe I was finally on the great Wall of China! After numerous photo opportunities and more stairs we had our picnic with our “western” treats from the supermarket yesterday, then wandered back down to wait for the group who had climbed higher.Wall was spectacular and it was a good place to see it with very few tourists around. Back to Beijing about 7 then final group meal which was a bit disappointing because the restaurant served all the veg food before any meat dishes came, so we didn’t get very much of anything. . What we got of the food was nice, but the local beer was good. Said goodbyes to all and off to bed. Sunny morning so up to nearby Jingshan park for the view over the Forbidden City. Park full of happy people being tourists, or the usual park activities. Great views of the palace, and back to the north and of Beihai Park and its pagoda. Walked up to the Bell Tower and the trendy Houhai and Qianhai area, with its cool shops, rooftop bars and lakes. Yandai Xiejie was especially cool. Followed a walking tour but it didn’t really work out and by the time we got to Huguo street, another cool shopping street it was mostly closed, but had a terrific vegetable pancake there. Had coffee in a Cafe 85, anice cake shop chain that was also in Shanghai, then onto the subwayback to Tiananmen Square to see Mao’s mausoleum. Walked past the two main gates, then to a really nice old street, Qianmen Dajie with lovely restored shops. Tried unsuccessfully to find a veg restaurant I’d found on the net but no one knew what it was. Instead got directed to a noodle place that specialized in “honeycomb” noodles, that were spongy and yummy and went well with with a Yanjing beer and some buckwheat dumplings. Found a bus that went all the way back toour hotel. What a busy day! Started our day with our usual egg in bread from the local store, becoming very good at saying two please with egg in Mandarin. Caught a taxi to the Lama Temple, one of oldest and largest Tibetan temples in China. Very interesting and colourful complex, the highlight being an 18m Buddha statue. A lovely temple in pretty grounds for wandering. Subway down to the Temple of Heaven, which has probably the most boring gardens in China, featuring hundreds of fir trees spread over a large distance. 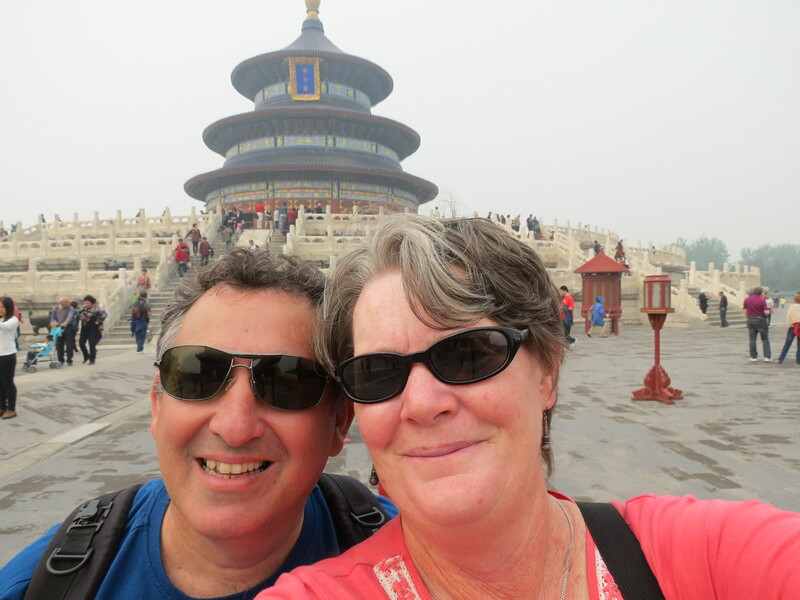 Some unusual buildings, including a large stepped altar, and the Temple of Heaven itself looking like a cake. Visited the Silk Market on the way back to hotel, but not much worth buying and got hassled a lot. Dinner at Alley Cafe then sadly time to pack our bags. Really enjoyed China and will certainly return to see more, and certainly feel brave enough to tackle it ourselves next time. Finished our trip with a few days in Hong Kong. Stayed at a nice hotel, the Panorama, which lived up to its name with great views across to Hong Kong Island. Buffet breakfast pretty boring though. Went back to the very nice vegetarian restaurant, Paramita on Haiphong Road, and just wandered about, went on a ferry ride and did a bit of shopping and more eating. Then of course it was back to boring old Australia.